Hello, and a very warm welcome to Day 1 in our week of Giveaways kindly offered by New Zealand Handmade Members! 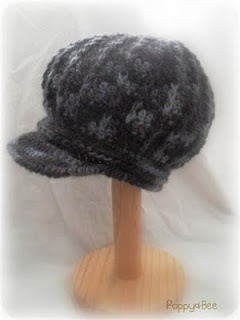 In shades of charcoal and blue/grey this is a very special hat from Poppy&Bee. A blend of NZ wool and alpaca creates a soft, light yet very warm hat. Cabled detailing in the body of the hat adds texture and interest to this fashionable addition to your wardrobe. a 50 page spiral-bound notebook, the cover being Photo art of an original Soft Earth Art needle felt creation. Today's 3 giveaways are open world-wide - tell your friends, family, neighbours! Winners will be selected at 10am NZ time Monday, 18 April via Random.org and will be notified via email. I'd love to win the poppy & bee hat! I just became a follower of your blog. I would love to win the notebook for my daughter. I'm a follower of softearth's world. ooooh, i love the soft earth art needle felted notebook! my 6 year old is learning to read and write and this would be a special notebook for her to write in and encourage that. i just became a fan on facebook (kristine b. )...signing up for the beautiful notebook for my 6 yo. i'm following on tumblr now! I'd love the hair ties! I'm a liker of Poppy & Bee on FB now. I'd also like to win the note book. I'm Also a follower of the blog page too. I'm following Tessa by Design too! My niece would love these hair ties. Thanks!! what a generous, beautiful giveaway! please enter me for the notebook and hair ties, as I've just recently made a new hat for the this spring. Would love to win the Poppy and Bee. I have shared via facebook. I really love the hat by Poppy and Bee! And... I'm a blog and facebook follower. I would LOVE to be in to win the Poppe and Bee hat, will be perfect for the Southland winter! I love the Poppy&Bee hat, if only I could enter! i follow maries and the nz blogs..
Love the Poppy and Bee Hat! Also LOVE Soft Earth Art! All of the items are lovely! I'm a fan at FB. Please enter me for the Soft Earth Art Notebook - it's gorgeous! I'm a fan on FB. Would love to win Poppy and Bee's hat! I'd love to win any of them! I'd love to win the poppy&Bee hat. Im subscribed via email to the NZHM blog and Im a follower of your blog too. I love the notebook and the hairties, I'm à follower of softearths world. I am a new follower of your NZHM facebook page. Please enter me for the spiral bound notebook. What a Magical cover - makes me want to believe in all things whimsical and ethereal. How delicious! Oh what a yummy Poppy and Bee hat. Please enter me for this also. Who can resist Winter now! I am a subscriber to Poppy n Bee. Love your current hat collection. Why not Giveaway c too! I love the material on those hair ties. I´m were so glad to win this wonderful photo-notebook. Marie is just such a lovely person, so kind and generous. Her artwork is so beautiful. I follow her work on Etsy and her blog and she always makes me smile. I would love to win her lovely spiral-bound notebook. Great giveaway! I'm an email subscriber and a follower on Facebook. Would like to enter all 3. Poppy and Bee Hat yay! I am a subscriber and would love to be in to win any of the 3 featured items. I love the poppy and bee hat as well its adorable!